In his stunning new introduction, Jonathan B. Imber offers a reassessment of Lovejoy's career as a thinker and as an active participant in the worldly affairs of academic life. He introduces to a new generation of readers some enduring principles of the vocation of the scholar to which Lovejoy not only subscribed but to which he also gave substance through his activities as an academic man. The opening statement provides both a fit tribute to a great pioneer in the history of ideas, and an example of intellectual history in its own right. 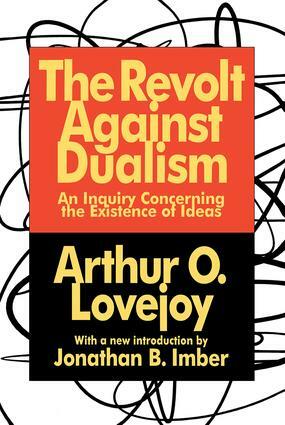 The Revolt Against Dualism will be a significant addition to the libraries of philosophers, sociologists, and history of ideas scholars.